I will get the best thing of the day out first, as it was practically the only good thing that happened today. This morning Ilia let me have a go on his KTM, and I loved it! I have always liked this bike, and I have been seriously considering one when the time comes to replace my V-Strom. I took it for a short spin and it felt great, responsive, powerful, comfortable and the suspension soaked up the potholes with complete ease. Ilia told me that it is so good on bad roads that he does not even bother checking the road ahead, he just goes. He had to go into training today and the shooting range he was going to was on the road to St. Petersburg, so he told me he would ride with me for a while. I was very happy to have him in front of me to navigate the way out of Moscow and out of the heavy traffic surrounding the city. We made a short stop at his wife’s job to say goodbye and take some pictures, and then went on. The traffic was quite bad, but it was to be expected, what I did not expect was the road after I had left Ilia at the crossroads to the shooting range and promised to meet again either in Russia or Barcelona. The road coming from the south was a nice motorway that made the long ride easy, so I was confident that the one connecting the two most important cities in the country would be even better, making light work of the 700km I had ahead of me. I really do not understand what kind of planning goes into Russian roads. Who in their right mind would think it is a good idea to have a two-lane road going through every single city, town and village between Moscow and St. Petesburg? I just could not believe that this was true. It took me forever to cover the first 200km away from the capital, it was an endless traffic jam, with cars and trucks completely stopped at some sections, drivers off chatting patiently to one another. If I had not been on a motorbike, I might still be there. Piece of advice – if you ever come to Russia, use a bike or the train. Do NOT take a car or you will spend your holidays in a traffic jam. Fortunately, half way there the road became a dual carriageway and I was finally able to make some good progress. The problem now, however, was the rain. I had checked the weather forecast before setting off, and it said that it would be cloudy in Moscow and sunny in St. Petersburg. Well, it was not. I do not know if weather forecasting is officially considered a science, but it definitely should not be. Like faith healers, tarot card readers, fortune tellers and economists, meteorologists are a bunch of charlatans that most of the time have no idea what is going on. They might be quite good at studying past weather and drawing statistics, and from time to time they might glance at their fancy radar and tell you where there are clouds and which way the wind is blowing, but accurately predict the weather? No way. A peasant who has spent his whole life sitting outdoors and learning to read the signs might be able to tell you if there is going to be sun or a storm in his area, but someone sitting behind a computer at a desk? Nope. It poured down all the way to St. Petersburg. All 700km. And to make things more interesting, I had completely forgotten a small but important detail – my GPS comes with very good maps for Europe, but not the rest of the world, so when planning the trip I complied and downloaded a map from Open Street Maps that covered the countries I was going to visit outside Europe. I had not included all of Russia, as it was huge and I was only going to travel through certain parts of it, so just outside St. Petersburg, I ran out of map. I had to stop, take out my mobile phone, find the hostel’s address on Google Maps and then memorise the way to get there, as I did not have anywhere to put the phone while riding. Fortunately, the traffic in the city was nowhere near as bad as in Moscow, in fact it was very quiet, and I got to the hostel without any problems. As I have discovered is usual practice in Russia, there was no sign at all indicating where the hostel was, so I just parked the bike in the street and walked up the stairs of the building at number 9, hoping there would be a hostel somewhere. 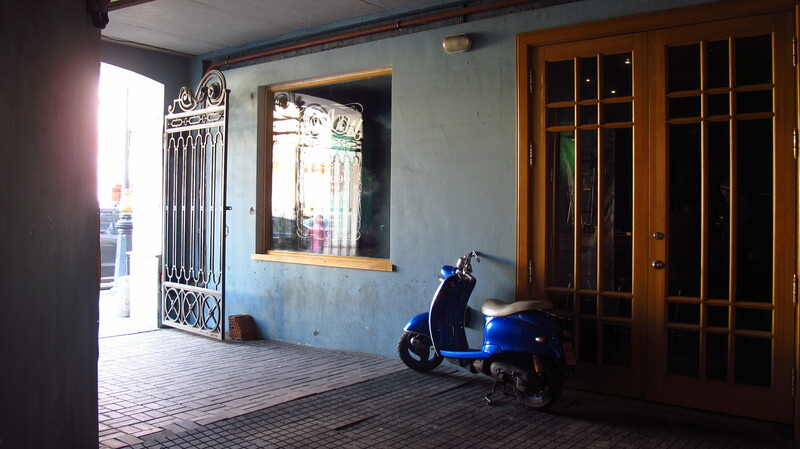 There was, and the girl at reception very kindly walked down to the street with me and showed me a gate leading to an inner court where I could park the bike for the night. The hostel was quite nice, in a very cool old building in the center. The other floors were occupied by a Jazz bar, an independent cinema, a dance school and a roof bar. A good place to stay. It is a shame that it is somewhat spoiled by the staff, the girls were nice enough, but the two guys could not care less about the hosts – they did not show me the facilities, did not give any information about the city or the hostel’s surroundings and were completely ignorant of the hosts. One of them was more interested on playing videogames in the common room computers and playing music until well past 1am and the other in his girlfriend to the point I wondered whether they were two teenagers on holiday at the hostel rather than staff. I went for walk around the area, which looked really nice, and then spent the rest of the evening planning the route ahead and trying to find accommodation in the following cities. Ah! And I finally found a Russia sticker for the motorbike. 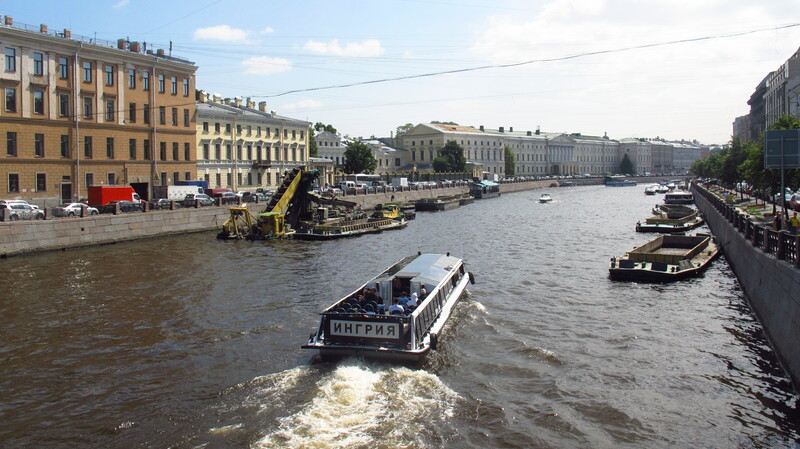 This entry was posted in Stroming The World 2013, Travel and tagged rain, St. Petersburg by Kilian. Bookmark the permalink.